Here it is: my first monthly round up of what I wrote during the last thirty days, (as promised here). 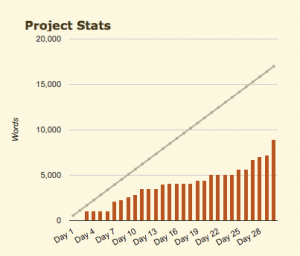 And this is the part why I tell you why it’s okay that I didn’t meet my goal: *takes deep breath* …I have tossed out the most recent draft of my first novel, replotted, and am starting again from scratch. For maybe the fifteenth time. Am I crazy? Probably. But I’m doing it anyway. I swear one day this thing will be finished, and I will be happy with it. ’till then, I’m setting the goal for next month at 10,000 words. *I’m counting posts for this blog and the blog over on my other website, but not the blog posts I wrote for clients.